Manisa is a self-taugt artist. Born into a community whose women folk have been practicing art during festivals and ceremonies for enerations, she started painting at a young age after watching her grandmother Phoolmaya Devi, mother Manju Jha and other women in the small town of Raghopur,Saharsa District, north Bihar. After her family moved to Delhi, Manisha completed her schooling and a Diploma in Interior Designing and Display from New Delhi Polytechnic for Women. Following her sister Bandana she graduated in architecture from Institute of Environmental Design,Vallabh Vidyanagar, Gujarat. 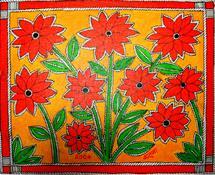 Along with her professional degrees, she continued her self-learning process in Madhubani painting.Her educational career promoted new dimensions within her paintings. By the time she finished her Masters in Urban and Regional Planning in Gujarat, Manisha decided to exhibit her work publicly after having been inspired by artists and art centres in Delhi and Vadodara. Manisha's first exhibition was sponsored by India International Center, New Delhi in 1998; in the same year she exhibited her works in Goa and Gujarat and from then on, started a full fledged artistic career along with her architectural practice. 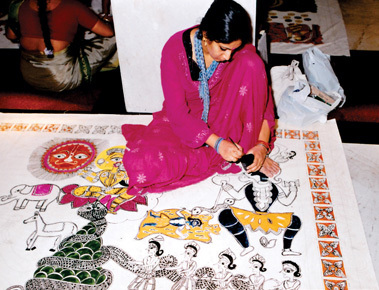 Along with her sisters Puja and Bandana, she has been taking workshops throughout the country to introduce people from all walks of life different aspects of Madhubani paintings. She established the Madhubani Art Centre in 2003, and also started a free school for women at Bhojpandaul village in Bihar, attended by more than five hundred. 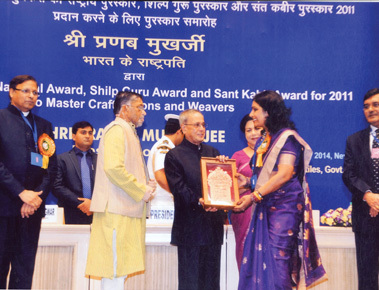 Among her awards are the prestigious National Award given by Hon'ble President of India Shri Pranab Mukherjee in the year 2014, she was awarded State Award from Government of New Delhi. 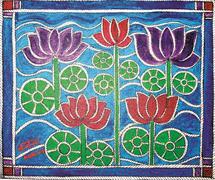 2008, the Kala-bharti award from the Bihar Sanshriti Mandal, Baroda, 1999 and Jaiprakash Narayan award in the field of Madhubani Painting, 2002. 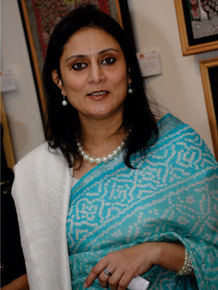 She is an active scholar and has presdented papers on Mithila painting at Indira Gandhi National Centre for Arts (IGNCA), New Delhi and also at National Museum, New Delhi. Manisha has been a visiting faculty in different architecture schools of Vadodara. She Sisters' Act currently pursues her art and a freelance architectural career in New Delhi and is writing a book on different aspects of Madhubani paintings. 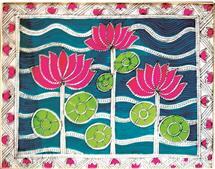 She also supports training centres of Madhubani artists to produce and market their work. In 2009, her work was selected to be part of "Aspects of Collecting" an extraordinary art project on the occasion of the 10th Anniversary of Essl Museum, Vienna, Austria from 20-11-2009 to 28-03-2010. She established Madhubani Art Centre in the year 2002 to support women artists from Mihila region of Bihar and "To enhance and keep alive the rich folk Art traditions by creating awareness and finest Art-works for economic sustainance." Bor in Raghopur, of Saharsa district in Bihar Bandana was second child of her parents. She did her schooling from New Delhi. An all rounder, she received many awards out of which a Gold medal in Architect and silver medal from Shanker's International was most prominent. After her schooling Bandana pursued an architecture course from Institute of Environmental Design, Vallabh Vidyanagar, Gujarat. She finished her course with a prestigious Gold Medal in Architecture in the year 1994. Since, then she has been working on a wide range of projects like housing, institutional design, interiors and research under the guidance on her father Suresh Jha. In 2000-2002 she joined a full time M-Tech course in Construction Management and Building Sciences from Indian Institute of Technology, (IIT), New Delhi. She has worked as a Project Manager, Architect and Associate Dean at Institute of Design, Engineering and Architecture at Rai foundation Mathura Road, New Delhi and as visiting faculty at Goa College of Architecture, Panjim, Goa, and at Interior Designing Department, South Delhi Polytechnic for Women, New Delhi. Bandana started exhibiting her Madhubani paintings in 2000 and has been showing her work along with her two sisters since then. She has also been part of the workshops they conduct in different parts of India. After working as Vice President of Ireko design in Mauritius for six years. Presently Bandana is doing her Phd from Indian Institute of Technology, New Delhi. Bandana lives and works from New Delhi, India. Puja is the youngest among the three and was bron in New Delhi. Along with her schooling from Summer Fields Public School, New Delhi, Puja was active in extra-curricular activities like sports, music and art Surrounded by an artistic environment at home, she joined the Interior Design course at South Delhi polytechnic for Women at Lajpat Nagar. Along with this she pursued a two-year Diploma in Fine Arts and Book illustration from Shanker's Academy of Fine Arts and Book Illustration, Children's Book Trust, New Delhi. Puja later joined an Architecture course from the Institute of Environmental Design, Vallabh Vidyanagar, Gujarat After her marriage, she joined a Post Graduate Diploma course in Planning with specialization in Housing from the Center for Environmental Planning and Technology, Ahmedabad, and this course she completed in the year 2003. Through out her educational career, she made time to work with her father and sisters and subsequentily has gained experience in the fields of art, architecture, interior designing and research in areas like planning. Puja has worked as Project Associate, at National Institute of Design, Ahmedabad and has worked extensively as principal "To enhance and keep alive the rich folk Art traditions by 4 creating awareness and finest Art-works for economic sustainance." Architect on different interior and architectural projects in different parts of the country. Presently Puja is practicing as an architect and artist in Bangalore, where she now resides. 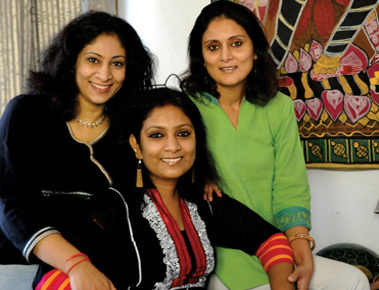 Puja joined her sisters in exhibition in the year 2001 and has exhibited her work with them since then. She has participated in workshops they have held in different parts of India. 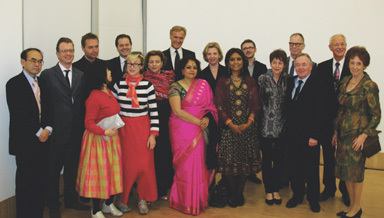 State Award in painting from Government of Delhi, India, 2007-08. Recognized artist-all India fine arts and crafts society, 1998. Recipient of Kala-Bharti award, By Bihar Sanskriti Manda, Baroda. 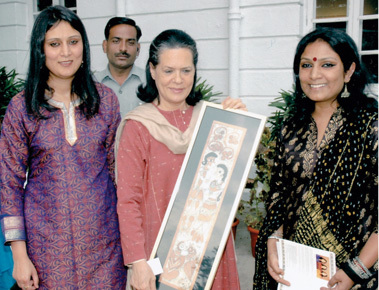 Jaiprakash Narayan Award in the field of Madhubani Paintings, Oct. 2002. General electric's New-York and India. BBDO ASIA, New- York and India. Victorinox, swiss army knives, Head office, Switzerland. Indira Gandhi, National Centre for Arts, New Delhi. Smt. Shiela Dixit, Chief Minister of New Delhi. Sankho Chaudhuri, Sculptor, New Delhi. Lalit Kala Academy, Panjim, Goa. Shri Pratap Singh Rane, Ex. C.M., Goa. Shri Ashok Ghosh, Governor Rotary International, New Delhi.